Time tracking spreadsheets, brought to you by Clockspot. If there's one thing that holds true for almost all businesses, it's the fact that they need a way to track how much time their employees are spending on work. Traditionally, Excel spreadsheets have been the go-to option that many businesses prefer for time tracking, either because they think it's a cheap and easy solution, or simply because its what they're accustomed to using. You might even employ them in your own day-to-day dealings. As many other businesses that have made the change will tell you, though, Excel isn't exactly all it's cracked up to be when you're trying to devise an efficient system for keeping time. First, consider this: Excel is extremely limited in what it can do. You'll have to enter all your information manually—increasing the likelihood of errors, and requiring you to remind employees to fill out their sheets every day. You can't do any automatic approvals, you have few analytical features, and your data is never going to be in real-time. This makes it difficult to keep an Excel timesheet up-to-date, and these woes are compounded by the fact that, if your team is using the same sheet to log all their data, only one person can work on it at a time. The process is slow and plodding, sucking away time you could have used to be productive trying to fill out timesheets one painful cell at a time. Things become more confusing when you bring new team members aboard. The formulas and unique codes that the original creators of your timesheet were accustomed to using might be indecipherable to the new manager you've put in charge of keeping time. They might have to start from scratch, or spend hours trying to discern what's going on. There are few privacy controls in Excel (meaning sensitive data is particularly vulnerable to mismanagement), and, on top of that, Excel isn't easily scalable. As your organization grows, it will become more and more difficult to manage the size of the database. Still, Excel does have its appeal for some businesses, particularly if you're only using it for small projects and need a solution that doesn't require much in the way of additional software. For many businesses, Excel is "free," as it comes default with Microsoft Office packages. It doesn't require you to undertake additional training for your employees, and advanced users can squeeze the program for every ounce of its worth—provided they know how. Excel might not be a perfect solution, but, if you're going to use it, why not make sure you have the best templates at your disposal? Clear entry fields for dates, times, jobs, hours worked, and more. Plenty of room to add detailed date/time entries. Condensed period makes it easy to focus on a smaller time window. Formulas for adding up weekly time and calculating total pay. Lacks the accuracy of digital timekeeping. Limited ability to group or categorize entries by job type or other factors. Requires a good deal of manual data entry. 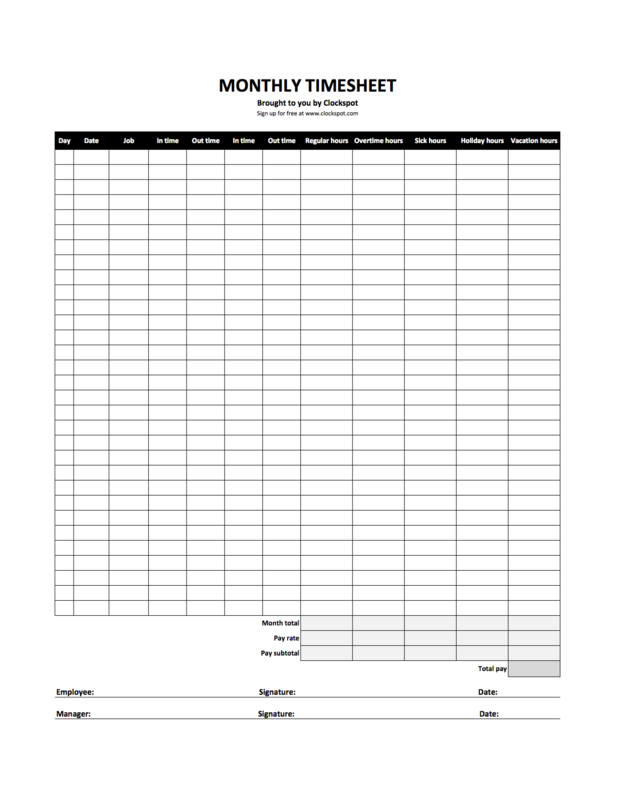 Also requires a manual signature, and you'll have to send the timesheet to payroll the old fashioned way. Doesn't collect a record of who's making changes and when. Makes keeping backups difficult, particularly if you're printing out a bunch of hard copies. You can track two weeks at once. Helps save paper by stacking up more entries on one sheet. Balances the size of entry fields and the total number of entries. Necessitates adding date entries to the days of the week. You'll have to manually input more entries per timesheet. No ability to sync your data with other applications. Makes it difficult to analyze broader trends in time and pay. Still using more paper than you would with a digital system. Still less accurate than a digital system. Provides an excellent monthly overview. 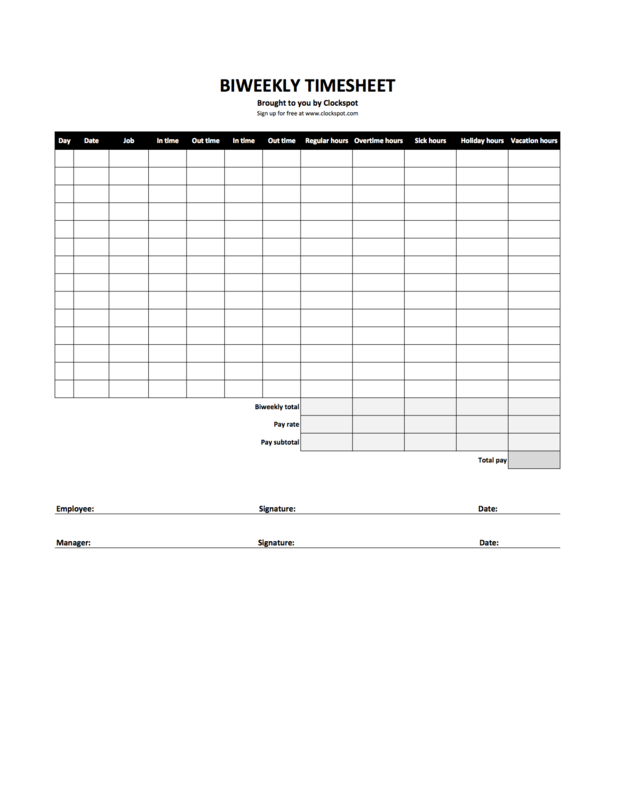 Reduces the need for multiple timesheets. Helps cut down on daily entries. Save even more paper when going to print. Limited entry space for fields. Only allows for the most basic data tracking. Easy to get confused and enter data in the wrong field. Still lacking in backup ability (good luck remembering all those hours if you lose it). 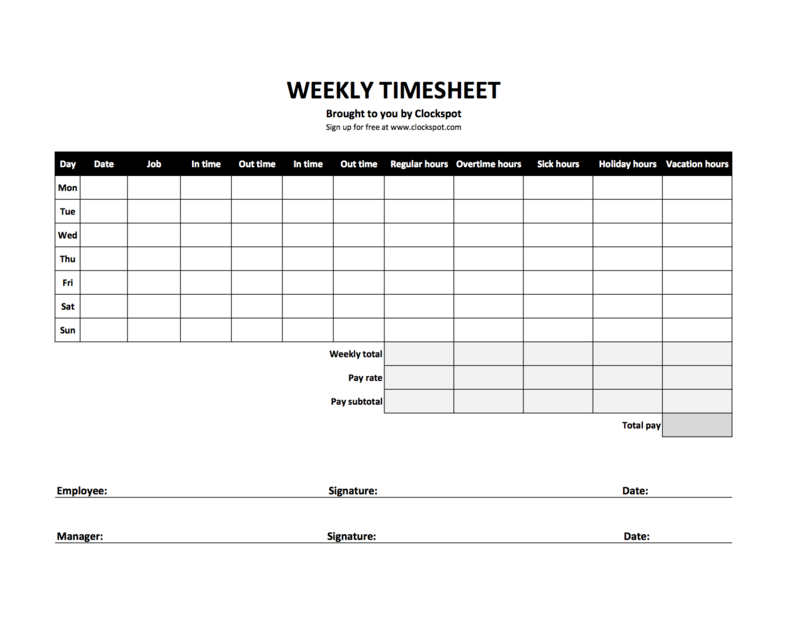 We've fine-tuned our downloadable timesheets to maximize their functionality and streamline how you track time. You can use these to get an easy overview of how many hours your team has been working, quickly utilize formulas to make your necessary invoicing calculations, and condense your timesheets so you have fewer to keep track of overall. When you're ready to switch to a more capable cloud-based online time clock solution like Clockspot, we'll be right here to help you make the transition.